गिरगाँव चौपाटी दो आतंकवादियों को मार गिराया गया।. ↑ Magnier, Mark; Sharma, Subhash (27 November 2008). "India terrorist attacks leave at least 101 dead in Mumbai". Los Angeles Times. पृ॰ A1. अभिगमन तिथि 28 November 2008. ↑ अ आ इ Press Information Bureau (Government of India) (11 December 2008). HM announces measures to enhance security. प्रेस रिलीज़. http://pib.nic.in/release/release.asp?relid=45446. अभिगमन तिथि: 14 December 2008. ↑ Masood, Salman (12 February 2009). "Pakistan Announces Arrests for Mumbai Attacks". New York Times. अभिगमन तिथि 12 February 2009. ↑ Haider, Kamran (12 February 2009). "Pakistan says it arrests Mumbai attack plotters". Reuters. अभिगमन तिथि 12 February 2009. ↑ Pakistan admits Pakistanis, LeT training camps used for Mumbai attacks. The News Tribe (12 November 2012). Retrieved on 19 जून 2014. ↑ Nelson, Dean. (8 July 2009) Pakistani president Asif Zardari admits creating terrorist groups. Telegraph. Retrieved on 19 जून 2014. ↑ Pakistan admits Mumbai terror link | The National. Thenational.ae (12 February 2009). Retrieved on 19 जून 2014. ↑ Press Trust of India (27 November 2008). "Army preparing for final assault, says Major General Poonam Gilurkar". The Times of India. India. अभिगमन तिथि 10 December 2008. ↑ "India Blames Pakistan as Mumbai Siege Ends". DW. 29 November 2008. अभिगमन तिथि 15 July 2011. ↑ Friedman, Thomas (17 February 2009). "No Way, No How, Not Here". The New York Times. मूल से 29 August 2012 को पुरालेखित. अभिगमन तिथि 17 May 2010. ↑ Schifrin, Nick (25 November 2009). "Mumbai Terror Attacks: 7 Pakistanis Charged – Action Comes a Year After India's Worst Terrorist Attacks; 164 Die". ABC News. अभिगमन तिथि 17 May 2010. ↑ Black, Ian (28 November 2008). "Attacks draw worldwide condemnation". The Guardian. UK. मूल से 1 December 2008 को पुरालेखित. अभिगमन तिथि 5 December 2008. ↑ अ आ इ "Wave of Terror Attacks Strikes India's Mumbai, Killing at Least 182". Fox News Channel. 27 November 2008. मूल से 4 December 2008 को पुरालेखित. अभिगमन तिथि 3 December 2008. ↑ Kahn, Jeremy (2 December 2008). "Jews of Mumbai, a Tiny and Eclectic Group, Suddenly Reconsider Their Serene Existence". The New York Times. मूल से 20 August 2014 को पुरालेखित. अभिगमन तिथि 3 December 2008. ↑ Magnier, Mark (3 December 2008). "Mumbai police officers describe nightmare of attack". Los Angeles Times. मूल से 6 December 2008 को पुरालेखित. अभिगमन तिथि 3 December 2008. ↑ अ आ "Tracing the terror route". The Indian Express. India. 10 December 2008. मूल से 28 May 2009 को पुरालेखित. अभिगमन तिथि 9 December 2008. ↑ "Police declare Mumbai siege over". BBC. 29 November 2008. मूल से 29 November 2008 को पुरालेखित. अभिगमन तिथि 29 November 2008. ↑ "Terrorist's name lost in transliteration". The Hindu. Chennai, India. 6 December 2008. मूल से 8 December 2008 को पुरालेखित. अभिगमन तिथि 7 December 2008. ↑ "Lashkar-e-Taiba (Army of the Pure) (aka Lashkar e-Tayyiba, Lashkar e-Toiba; Lashkar-i-Taiba) – Council on Foreign Relations". Cfr.org. मूल से 5 June 2010 को पुरालेखित. अभिगमन तिथि 31 December 2010. ↑ Schmitt, Eric; Somini Sengupta, Jane Perlez (3 December 2008). "US and India See Link to Militants in Pakistan". The New York Times. अभिगमन तिथि 3 December 2008. ↑ Somini Sengupta; Eric Schmitt (3 December 2008). "Ex-US Official Cites Pakistani Training for India Attackers". The New York Times. मूल से 2 April 2009 को पुरालेखित. अभिगमन तिथि 14 February 2009. ↑ "Pakistan Continues to Resist India Pressure on Mumbai". Time. 8 January 2009. मूल से 14 January 2009 को पुरालेखित. अभिगमन तिथि 8 January 2009. ↑ "Pak court grants bail to Mumbai terror attack accused Lakhvi". Yahoo. 9 January 2015. अभिगमन तिथि 9 January 2015. ↑ "Lakhvi gets bail, again". Dawn, Pakistan. अभिगमन तिथि 9 January 2015. ↑ "1993: Bombay hit by devastating bombs". BBC. 12 March 1993. मूल से 11 December 2008 को पुरालेखित. अभिगमन तिथि 12 November 2010. ↑ Monica Chadha (12 September 2006). "Victims await Mumbai 1993 blasts justice". BBC. मूल से 10 December 2008 को पुरालेखित. अभिगमन तिथि 12 November 2008. ↑ "Blast outside Ghatkopar station in Mumbai, 10 killed". rediff.com India Limited. 6 December 2002. अभिगमन तिथि 19 August 2008. ↑ "1992: Mob rips apart mosque in Ayodhya". BBC. 6 December 1992. मूल से 7 December 2008 को पुरालेखित. अभिगमन तिथि 11 November 2008. ↑ "1 killed, 25 hurt in Vile Parle blast". The Times of India. India. 28 January 2003. अभिगमन तिथि 19 August 2008. ↑ "Fear after Bombay train blast". BBC. 14 March 2003. अभिगमन तिथि 19 August 2008. ↑ Vijay Singh; Syed Firdaus Ashra (29 July 2003). "Blast in Ghatkopar in Mumbai, 4 killed and 32 injured". rediff.com India Limited. मूल से 8 September 2008 को पुरालेखित. अभिगमन तिथि 19 August 2008. ↑ "2003: Bombay rocked by twin car bombs". BBC. 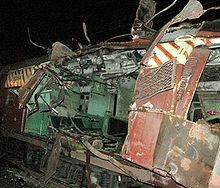 25 August 2003. अभिगमन तिथि 19 August 2008. ↑ "For the record: The 11/7 chargesheet". rediff.com India Limited. 11 July 2008. अभिगमन तिथि 19 August 2008. ↑ "India: A major terror target". The Times of India. India. 30 October 2008. मूल से 12 January 2009 को पुरालेखित. अभिगमन तिथि 11 November 2008. 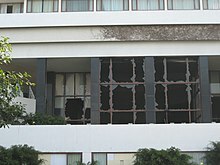 ↑ "Gunfire heard at two Mumbai hotels - CNN.com". ↑ Dwight Hamilton; Kostas Rimsa (19 November 2007). Terror Threat: International and Homegrown Terrorists and Their Threat to Canada. Dundurn Press Ltd. पृ॰ 103. आई॰ऍस॰बी॰ऍन॰ 978-1-55002-736-5. अभिगमन तिथि 28 September 2011. ↑ "Rs 50, 000 not enough for injured". Indian Express Newspapers (Mumbai) Ltd. 21 July 2006. अभिगमन तिथि 11 November 2008. ↑ Editorial – K. Jaishankar – IJCJS vol 2 issue 2 July–December, 2008. Sascv.org. Retrieved on 19 June 2014. ↑ "India police: Indian Government spy agency behind Mumbai bombings". CNN. 1 October 2006. अभिगमन तिथि 11 November 2008. ↑ "Mumbai Police blames ISI, LeT for 7/11 blasts". The Times of India. India. 30 September 2006. अभिगमन तिथि 11 November 2008. ↑ Rahman, Maseeh; Jones, Sam (1 December 2008). "Rumours abound as inquiry begins its search for truth". The Guardian. London. मूल से 2 December 2008 को पुरालेखित. अभिगमन तिथि 1 December 2008. ↑ Swami, Praveen (2 December 2008). "A journey into the Lashkar". The Hindu. Chennai. ↑ Schmitt, Eric; Sengupta, Somini (4 December 2008). "New York Times, Quoting a former US defence official". The New York Times. अभिगमन तिथि 23 April 2010. ↑ Williams, Matthias (29 नवंबर 2008). "Militants in Mumbai wanted an Indian 9/11". Reuters. अभिगमन तिथि 16 नवंबर 2015. ↑ Lakshmi, Rama (3 December 2008). "Details Emerge From Sole Arrested Gunman". The Washington Post. अभिगमन तिथि 3 December 2008. ↑ Schmitt, Eric; Sengupta, Somini (3 December 2008). "Ex-U.S. Official Cites Pakistani Training for India Attackers". The New York Times. मूल से 11 May 2013 को पुरालेखित. अभिगमन तिथि 4 December 2008. ↑ Moreau, Ron; Mazumdar, Sudip (27 November 2008). "The Pakistan Connection". Newsweek. मूल से 6 December 2008 को पुरालेखित. अभिगमन तिथि 28 November 2008. ↑ अ आ "Meet the men who attacked Mumbai ..." Rainbow Skill : Knowledge Portal. अभिगमन तिथि 12 दिसंबर 2016. ↑ अ आ "3 witnesses identify Kasab, court takes on record CCTV footage". The Economic Times. India. 17 June 2009. मूल से 20 June 2009 को पुरालेखित. अभिगमन तिथि 17 June 2009. ↑ अ आ "Photographer recalls Mumbai attacks". The News International. 16 June 2009. मूल से 20 June 2009 को पुरालेखित. अभिगमन तिथि 17 June 2009. ↑ "26/11 attacks: Two years on, rail announcer Vishnu Zende has moved on". DNA. PTI. 24 November 2010. अभिगमन तिथि 8 May 2015. ↑ Raghavendra Rao (14 December 2008). "CST announcer who saved lives rewarded". Indian Express. ↑ "Judgement, THE HIGH COURT OF JUDICATURE AT BOMBAY, THE JUDGMENT RESERVED : 7 FEBRUARY 2011; THE ORDER IS PRONOUNCED: 21 FEBRUARY 2011". The Times Of India. ↑ "Info from cop in Karkare's jeep led to Kasab's arrest". Mid Day. 3 December 2008. मूल से 17 June 2011 को पुरालेखित. अभिगमन तिथि 15 July 2011. ↑ "Mumbai gunman guilty of 'act of war'". The National (Abu Dhabi). 4 May 2010. अभिगमन तिथि 15 July 2011. ↑ "Jukexboxes on the Moon: Stardom is martyrdom: India arrives in the American imagination". Triple Canopy. अभिगमन तिथि 15 July 2011. ↑ Blakely, Rhys; Page, Jeremy (1 December 2008). 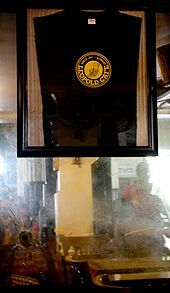 "Defiant Leopold café shows that Mumbai is not afraid". The Times. UK. अभिगमन तिथि 19 March 2009. ↑ "Leopold Cafe reopens amidst desolation". Deccan Herald. India. 1 December 2008. मूल से 5 December 2008 को पुरालेखित. अभिगमन तिथि 19 March 2009. ↑ "Mumbai attack: Timeline of how the terror unfolded". Daily Mirror. UK. 27 November 2008. मूल से 28 May 2009 को पुरालेखित. अभिगमन तिथि 25 May 2009. ↑ "Taj Hotel Burns, 2 Terrorists Killed". CNN IBN. 27 November 2008. अभिगमन तिथि 27 November 2008. ↑ "Taj Hotel Attacked". TTKN News. 27 November 2008. अभिगमन तिथि 27 November 2008. ↑ "Scores killed in Mumbai rampage". CNN. 26 November 2008. मूल से 2 December 2008 को पुरालेखित. अभिगमन तिथि 26 November 2008. ↑ Stevens, Andrew; Kapur, Mallika; O'Sullivan, Phil; Turner, Phillip; Hiranand, Ravi; Wong, Yasmin; Shah Singh, Harmeet (27 November 2008). 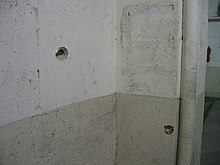 "Fighting reported at Mumbai Jewish center". CNN. मूल से 2 December 2008 को पुरालेखित. अभिगमन तिथि 28 November 2008. ↑ Charter, David (27 November 2008). "Tory MEP flees for his life as gunman starts spraying the hotel bar with bullets". The Times. London. अभिगमन तिथि 21 February 2008. ↑ "EU trade delegation in Mumbai safe, delegate says". Deutsche Presse-Agentur. 27 November 2008. अभिगमन तिथि 23 February 2009. ↑ अ आ इ Charter, David (27 November 2008). "Tory MEP flees for his life as gunman starts spraying the hotel bar with bullets". The Times. UK. अभिगमन तिथि 27 November 2008. ↑ "EU parliament staff member wounded in India shootout". EU business. 27 November 2008. मूल से 3 December 2008 को पुरालेखित. अभिगमन तिथि 21 February 2009. ↑ "Relacja Polaka z piekła" (पोलिश में). Reuters, TVN24. 27 November 2008. अभिगमन तिथि 21 February 2009. ↑ अ आ "EU parliament staff member wounded in India shootout". The Economic Times. India. 27 November 2008. अभिगमन तिथि 21 February 2009. ↑ Press Trust of India (27 November 2008). "200 people held hostage at Taj Hotel". NDTV. मूल से 22 November 2010 को पुरालेखित. अभिगमन तिथि 21 February 2009. ↑ Thomson, Alice; Rachel Sylvester (27 November 2008). "Sir Gulam Noon, British 'Curry King': how I escaped bombed hotel". The Times. UK. अभिगमन तिथि 27 November 2008. ↑ "NSG ends reign of terror at Nariman". The Times of India. India. 29 November 2008. अभिगमन तिथि 23 February 2009. ↑ "Siege at Nariman House ends, two terrorists killed". The Hindu. Chennai, India. 29 November 2008. मूल से 1 December 2008 को पुरालेखित. ↑ Daniel Trotta (28 November 2008). "Rabbi killed in Mumbai had gone to serve Jews". Reuters. मूल से 3 December 2008 को पुरालेखित. अभिगमन तिथि 29 November 2008. 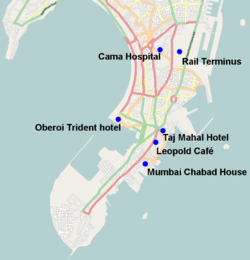 ↑ ""Commandos Launch Operations to Clear Luxury Hotels Seized by Gunmen in Mumbai"". अभिगमन तिथि 30 नवम्बर 2017. 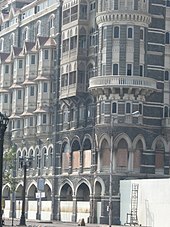 ↑ "Mumbai bustles but also remembers 26/11 victims". CNN IBN. मूल से 29 November 2009 को पुरालेखित. अभिगमन तिथि 26 November 2009. ↑ Shah Singh, Harmeet (26 November 2010). "India remembers Mumbai dead". CNN. अभिगमन तिथि 31 December 2010. ↑ TERROR TAKES OVER MUMBAI. The Statesman. ↑ "Two Nelson County residents confirmed dead in India". WBDJ. 28 नवंबर 2008. अभिगमन तिथि 28 नवंबर 2008. ↑ "Israel: 6 bodies removed from Jewish center". The Associated Press. 28 नवंबर 2008. मूल से 4 दिसंबर 2008 को पुरालेखित. अभिगमन तिथि 28 नवंबर 2008. ↑ "Israel: Eight Israelis killed in Mumbai attacks: ministry". The Associated Press. 28 नवंबर 2008. मूल से 2 दिसंबर 2008 को पुरालेखित. अभिगमन तिथि 28 नवंबर 2008. ↑ "Statement by Minister Cannon on the Death of Second Canadian in Mumbai". Foreign Affairs and International Trade Canada. 28 नवंबर 2008. अभिगमन तिथि 28 नवंबर 2008. ↑ "Battle rages for Mumbai hostages". अभिगमन तिथि 28 नवम्बर 2008. ↑ Mumbai operation appears nearly over. Retrieved on November 28, 2008. ↑ "List of the deceased". NDTV. नवम्बर 28, 2008. अभिगमन तिथि 29 नवंबर 2008. ↑ "Filipino tourist injured in Mumbai hotel attack". अभिगमन तिथि 28 नवम्बर 2008.